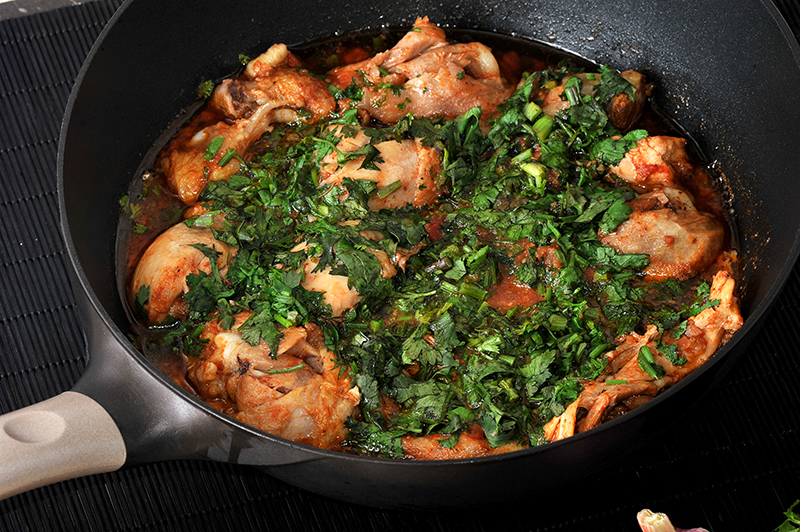 The Georgian word for pheasant is khokhobi, and one of the inspired dishes of Georgian cuisine is chakhokhbili. These days chicken, rather than pheasant, constitutes the main ingredient of chakhokhbili, but the manner of preparation has not changed. The fowl is simmered with vegetables and herbs until tender, with no liquid added. Just as Georgian boys were once judged by their skill in cutting mtsvadi sticks, so Georgian girls were deemed marriageable according to their ability to cut up chicken for chakhokhbili. The most traditional recipes call for seventeen precise pieces, although today a mere ten will suffice. Melt the butter in a large skillet and brown the chicken pieces on all sides. Stir in the chopped onions and cook for 10 minutes, continuing to stir occasionally. Add the prepared tomatoes and cook, covered, for 30 minutes, or until the chicken is done. Stir in the garlic, herbs, hot pepper, and salt and pepper to taste. Cook, covered, 5 minutes longer. Let stand 5 minutes, covered, before serving.